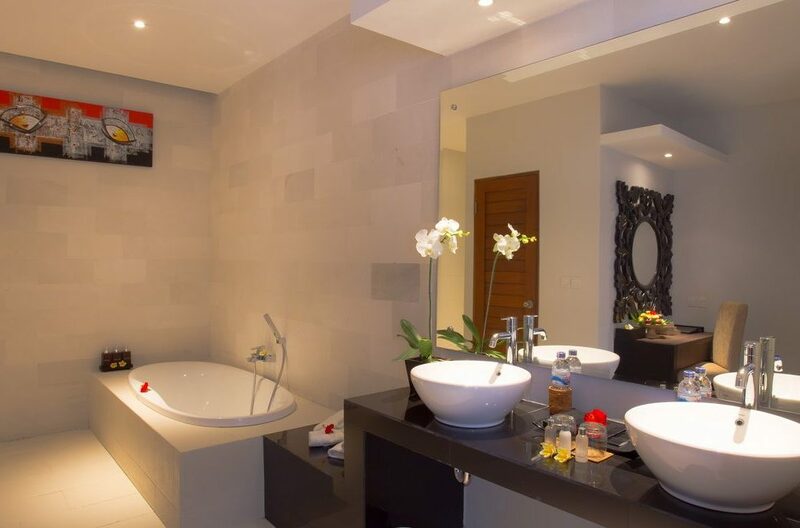 Perfectly positioned in the heart of Seminyak just a few minutes from the activity of Seminyak Square and the fashionable Petitenget strip, The Light Exclusive Villas and Spa offers modern accommodation with 1-4 bedroom private pool villas. 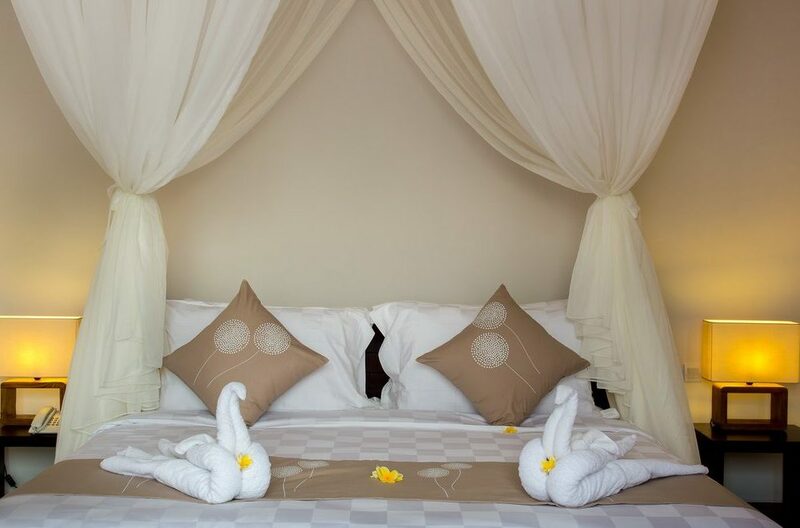 Thus the complex offers an ideal accommodation option for couples, groups of friends and families alike. 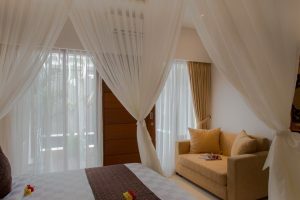 Each villa offers private lounge and dining areas with kitchenettes and very comfortable en-suite bedrooms. 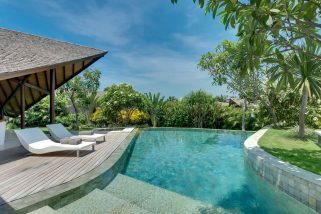 Each of the villas feature private pools with a generous timber deck where you can soak up the sun on the outdoor rattan sun recliners. 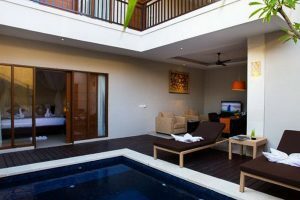 There is a touch of tropical greenery around the pool with a fragrant frangipani in each and a towering perimeter wall gives you all the privacy you will need. 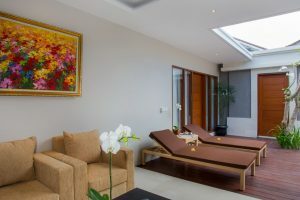 The living areas are open-air and very modern with a minimalist feel to their design and decor. 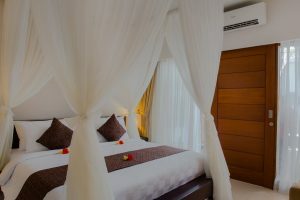 Large ceiling fans will keep you cool here and there is comfy sofa and timber dining table where you can enjoy meals together or watch some TV on the LCD TV with cable channels. 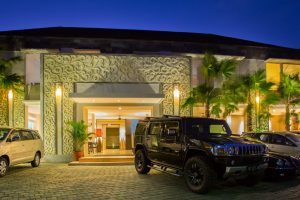 There is also a sound system, CD player and DVD not to forget fast wi-fi so all your entertainment needs are taken care of. The bedrooms are simply furnished, clean an pleasant with sliding doors opening to the pool or upstairs terrace area. Queen size beds with pristine linens and sheer white netting guarantee a comfortable nights sleep. The en-suites feature built-in soaking tubs, twin vanities and rain showers. The rooms are air-conditioned and there are large flat-screen TV’s to lie back and relax while watching a movie. The complex is serviced by a large team of professionally trained Balinese staff. There is a restaurant where you can enjoy complimentary breakfasts and order room service directly to your villa along with bar service as well. 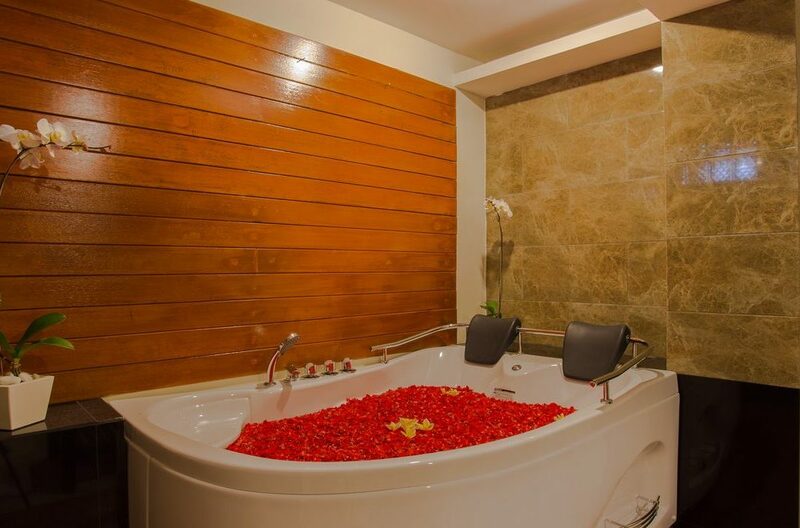 The dedicated spa centre has a range of services and the spa room has a huge jacuzzi for 2 for a romantic interlude post massage. 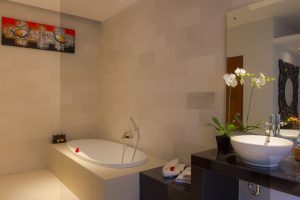 There is 24 hour concierge service as well. 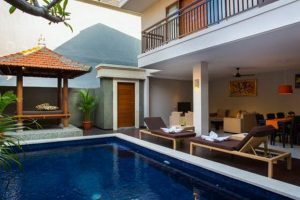 Situated along Jalan Pangkung Sari guests can easily walk to Seminyak’s Eat Street along the way passing some great places to eat including Settimo Cielo, rated as one of the best restaurants on the island, The German Beer Garden and Happy Chappy’s. 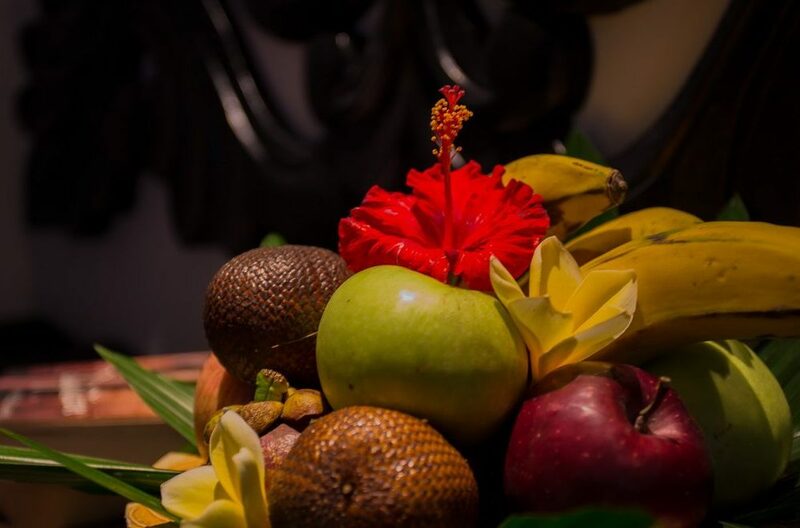 Head in the opposite direction to the trendy Petitenget strip where you will pass Dhyana Japanese restaurant, The Gourmet Cafe great for casual dining all day, Revolver for excellent coffee, Cafe Organic, Sarong and Saigon Street. 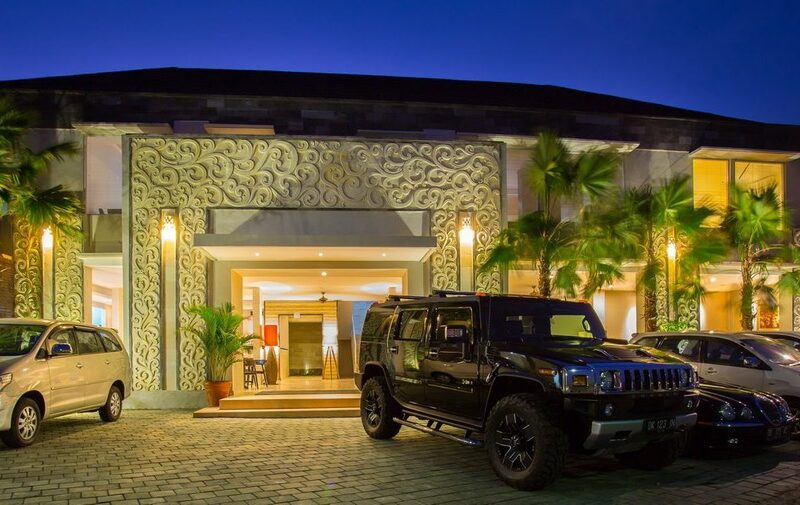 Just over the road from here is the famous Potato Head Beach Club that’s suitable for a fun family day out. 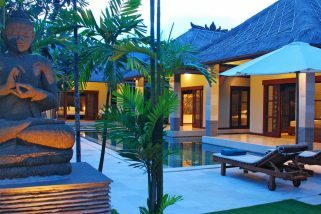 The Layar is a cluster of 23 individual villas offering world class design and architecture accompanied with five-star service provided by 100+ staff. 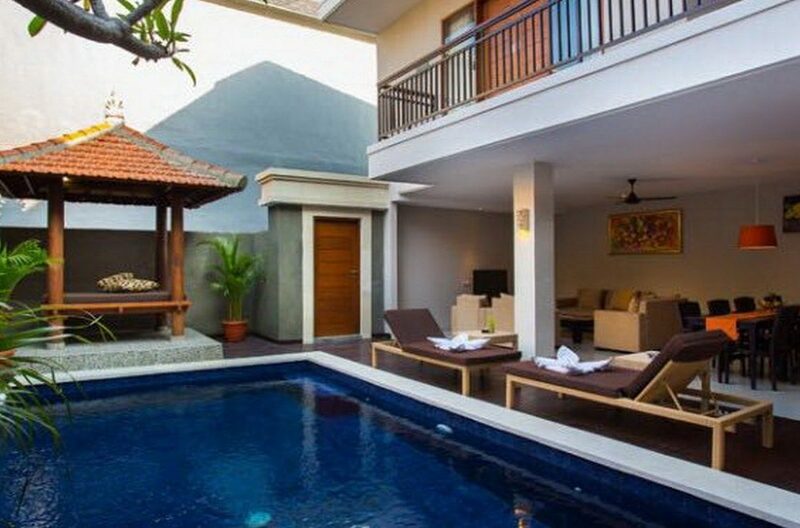 Villa Cinta is a 3 bedroom private pool villa situated in Jalan Drupadi, a short stroll to bustling Seminyak and only a 10 min stroll to the beach. 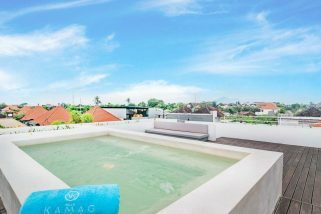 Villa Kamag is a lovely, serene 4 bedroom Seminyak villa located just on the fringes of Seminyak. This four bedroom villa is luxurious, beautiful, spacious and comfortable.